The magazine would doubtless like for this to be the end of the discussion, and it probably will be. Most readers will forget it happened, except the ones who already hated the magazine. But the thing that happened last night is interesting for a couple of reasons, and I think it’s worth actually laying them out before we all agree to drop it and hope it never happens again. Specifically, there are two kinds of “bad” to talk about, here, and it’s hard to talk about them at the same time, so I won’t. The first set of problems is purely about business. The magazine’s ad team, which is run separately from its journalistic counterpart, sold the Church of Scientology a “sponsor content” slot, ran an article (presumably) written by the church, and (presumably) made some kind of agreement about blocking/removing negative comments that led to last night’s Twitter riot. 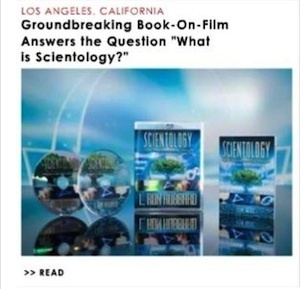 The Church of Scientology is a highly controversial organization. The choice to run any church-produced promotional material was also therefore going to be controversial. It’s difficult to imagine that the ad team simply didn’t realize this—more on that in a minute. The “article” was presented in a way that is visually indentical to other Atlantic content, except for a small disclaimer at the top. It was not visually distinguished in unmistakable ways, which meant that some readers were likely to mistake it—content known to be controversial—for legitimate editorial material. The sidebar content was not separately flagged, and was even more easily mistaken for “regular” Atlantic content. The comments section for the article looked exactly like every other comments section on the Atlantic website, but was actually very different: it was, in fact, moderated by the magazine’s marketing staff, who blocked or deleted comments that criticized either the Church of Scientology or the Atlantic’s decision to run the advertorial. “Related content,” courtesy Casey Gollan. So, to recap, the Atlantic’s ad team elected first to run a prominent ad from a controversial organization, and then to do it in a way that was sufficiently ambiguous that some readers felt tricked and many felt was so shady that it damaged the magazine’s credibility. Given that the Atlantic’s entire business model rests on its credibility, this is a serious error. Moreover, there is a precedent for handling controversial ads. You mark them out as ads just like everything else and you don’t try to trick anyone into thinking they’re not. This is the easy part. Investigative journalism is hard. Writing as well as Ta-Nehisi Coates is hard. Managing the budget for a print/ditigal magazine while the print world is in freefall is hard. Spotting sponsorship deals that will spook and anger readers, especially if they’re published in deceptive ways? This should not be hard. I want to spend an extra moment on this, because a lot of people last night seemed not to understand why some of us found the Atlantic’s comment moderation so problematic. Here’s what happened: Someone with the mod keys to an Atlantic Disqus account blocked (as in “did not allow to be published”) comments critical of Scientology, and—I think even more importantly—comments critical of the Atlantic and its decision to run the advertorial. One such comment, by Disqus employee Mat Mullen, slipped through and remained up long enough to get at least 766 “upvotes” before it was deleted. An hour or so after the Twitter outrage wave, whoever was moderating the comments simply stopped allowing any to be published. This morning, the Atlantic says it was their marketing department. On one hand, I guess it’s nice that the Atlantic business team didn’t let their client directly delete comments—but on the other, it means that Atlantic marketing team deleted and blocked criticism of the Atlantic on the Atlantic website. In the tiny world of journalist ethics, that should be a big deal. But this all pales in comparison to the simple betrayal of the reader’s trust. When you fail to explicitly state that you’re blocking and deleting comments critical of your subject and your publication, you imply that you aren’t—especially when every other comments section on your website allows negative comments. You are presenting a tiny selection of comments by supporters of your client as the entire conversation. You are telling a lie. A year ago, I started working with people who write code in and for newsrooms, and since then, my sympathy for journalists has only increased. I understand, now, how a single news organization can publish stellar investigative reporting and daft, shallow fluff pieces. I see how angry many journalists are about business decisions that reduce their credibility, and that they can’t even speak about on the record. And I see a lot of writers, editors, designers, and developers working for so much less money than they’d make in other fields because they think it is important to reveal the hidden workings of power and drag secret things into the light. And because of all that, I’m not particularly vulnerable to the widespread belief that “media people” are all slick liars running cons on a public they see as marks. I have been trying to think this through for a while: quality vs morality in journalism. First, fight for, second, just elitism. Dis/Agree? But the whole point of actual journalism—as distinct from, say, 4chan or tabloids—is that it works within an ethical framework to accomplish something of use to the public. And those ethical positions can’t stop at the “Chinese wall” that is supposed to separate ad sales (and thus financial pressure) from editorial work, because from the outside, and sometimes even on the inside, it is all the same thing. If you wouldn’t knowingly lie to your readers in an editorial or an investigative feature, you shouldn’t deceive them with interface design choices that obscure the line between ads and “content.” If you have ethical guidelines about what you publish, they should apply to what you publish. Anything else shows a contempt for your readers that will eventually and rightfully catch up to you. Edited to add: Although it’s always been my policy not to publish screaming or abusive comments here, I feel the need to reiterate that today. Not a journalist, not running a newspaper. Keep it civil or get your own blog. This entry was posted in Community, Ethics, Publishing. Bookmark the permalink.